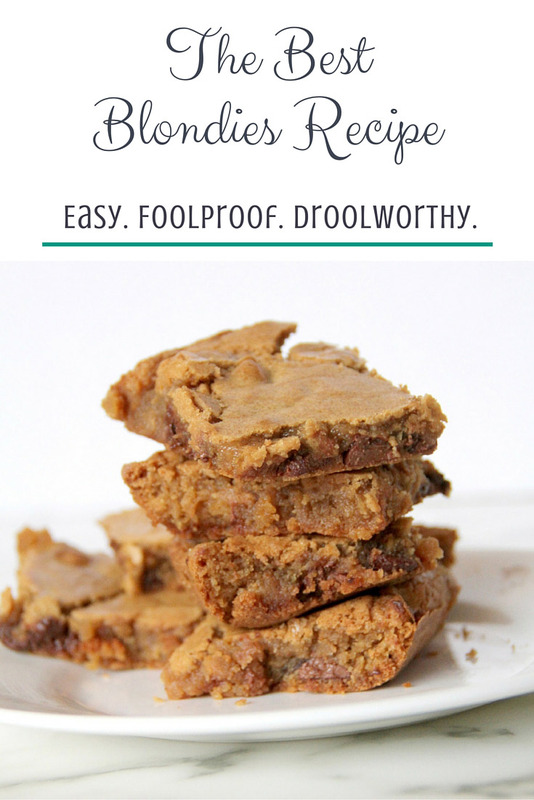 Home » Recipes » Blondies Recipe — Simple and Foolproof! 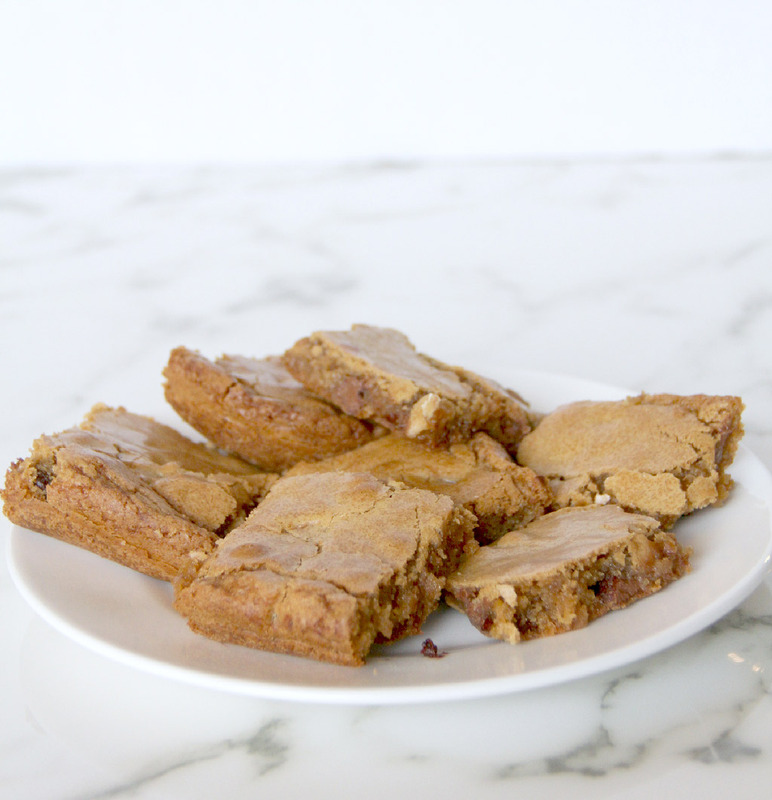 Blondies Recipe–add chocolate chips, nuts, toffee, dried fruit–endless possibilities! These gooey, chewy, brownie-cookies are amazing and super easy! 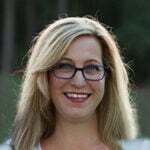 Blondies defy description—are they brownies posing as chocolate chip cookies? Or are they cookies pretending to be brownies? These are the philosophical musings of a food blogger. Blondies are quick and easy to make, and best of all, they offer limitless possibilities for mix-ins: Chocolate chips, nuts, dried fruit, or a mixture of all three! In my old Taste of Georgia cookbook, these are called Caramel Brownies—but there’s no caramel! Just brown sugar. Although…a layer of caramel sauce would take these from amazing to extraordinary, don’t you think? Chocolate chip blondies with caramel sauce recipe coming soon! This blondies recipe is so easy! I use my stand mixer but you could use a large bowl with a hand mixer or even a whisk. Start by melting the butter and set aside to cool. Then prepare a 9 x 13-inch dish, lightly greasing with butter or non-stick baking spray, and then a dusting of flour. Did you know that adding a dusting of flour to your greased pans helps the batter to rise instead of sliding down the greasy sides? Then mix the butter with the sugars, add eggs and vanilla, then flour, baking powder, and salt. Then stir in whatever ingredients you want to mix in. Chocolate chip blondies are my most beloved, but I like to try different combinations of flavors depending on the occasion. 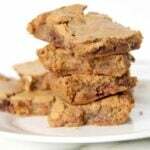 I use a mix of brown and regular white sugar in these blondies–brown sugar deepens the flavor and adds a slightly nutty undertaste. Although I don’t usually add nuts, you certainly can. My favorite way to make blondies is with bittersweet chocolate chips because it cuts the sweetness factor just enough. Another great combination would be white chocolate and macadamia nuts—and you could add dried cranberries to that one! Or pistachio nuts! 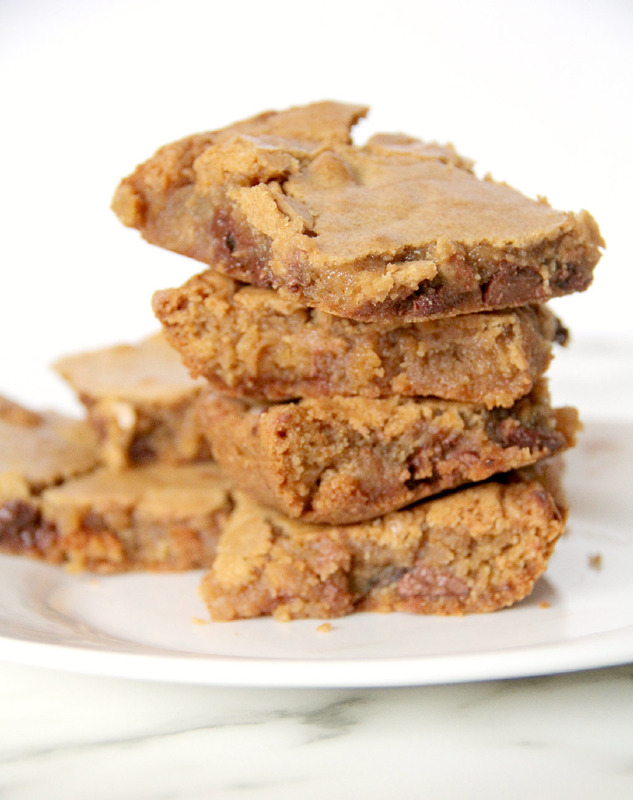 I also love toffee chips in these blondies, either alone or mixed with chocolate chips. 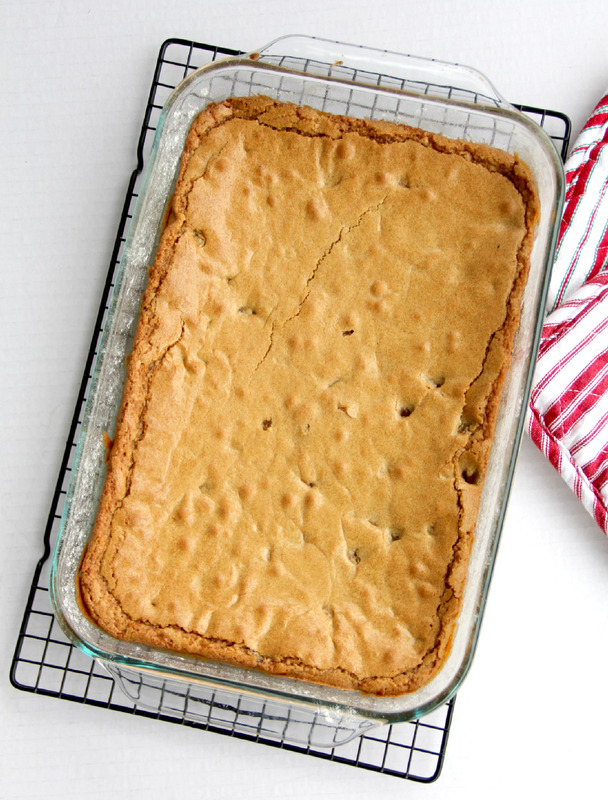 Blondies Recipe -- Simple and Foolproof! 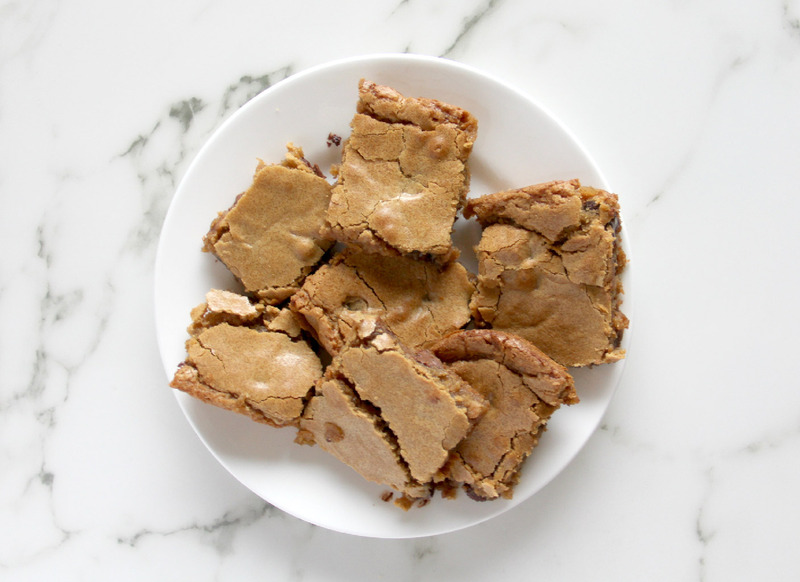 Blondies Recipe--add chocolate chips, nuts, toffee, dried fruit--endless possibilities! Melt butter and set aside to cool slightly. Prepare 9 x 13-inch baking dish or pan with non-stick baking spray or butter and a light dusting of flour. Add butter and sugars to bowl of stand mixer and beat until smooth. Add eggs and vanilla and mix until blended. Add flour, baking powder, and salt, and mix until blended. Stir in nuts, chips, or whatever mixins you are using. Bake 20-25 minutes or until tester comes out mostly clean and center is barely set--don't overbake! Cool completely on rack before cutting.